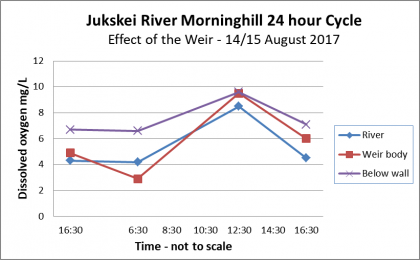 Monitoring the Jukskei River for 24 hours near the Clarkson Rd Weir in Morninghill, Bedfordview, showed the smell was fairly constant through the day but was slightly stronger at sunrise. The overall impression was that the river was more polluted in the early morning than at other times of the day, but this is probably due to local weather or micro-climate rather than changes in the water. The smell arises from the continuous flow of polluted water passing through, rather than accumulated sludge giving anaerobic conditions. The problems of pollution and smell will only be resolved when the source pollution in the Johannesburg CBD is addressed. 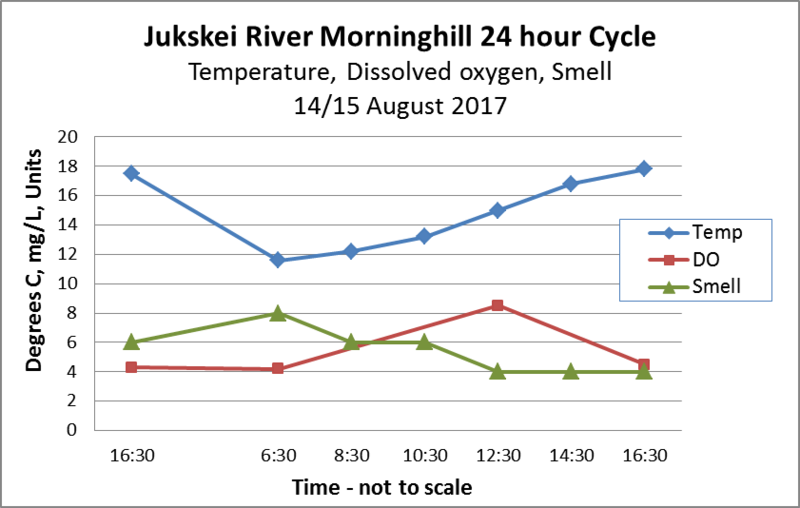 (i) Temperature: warmer water holds less dissolved gas so possibly smell is released from the river as the water temperature rises in the afternoon. (ii) Dissolved oxygen: anaerobic conditions support the growth of bacteria that metabolize sulpher, releasing a distinctive smell. (iii) Surface water level of the river and the quality of the water: this would show if the water flowing from the higher reaches of the Jukskei River over the course of the day changed and could impact smell or appearance. 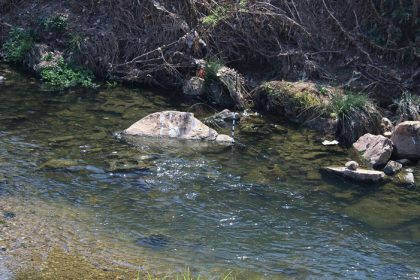 The photo of the site project, about 100 m upstream from the Clarkson Rd Weir, shows how clear the water was (click to image to enlarge). The metered pole showing the water level is in the center of the photo. 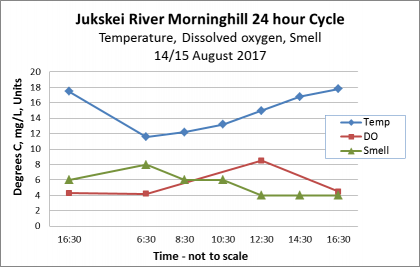 Temperature and dissolved oxygen (DO) followed the expected daily rhythm. Temperature was lowest in the early morning, rising through to late afternoon. Dissolved oxygen rose during the day as the plants photosynthesize, and declined overnight. 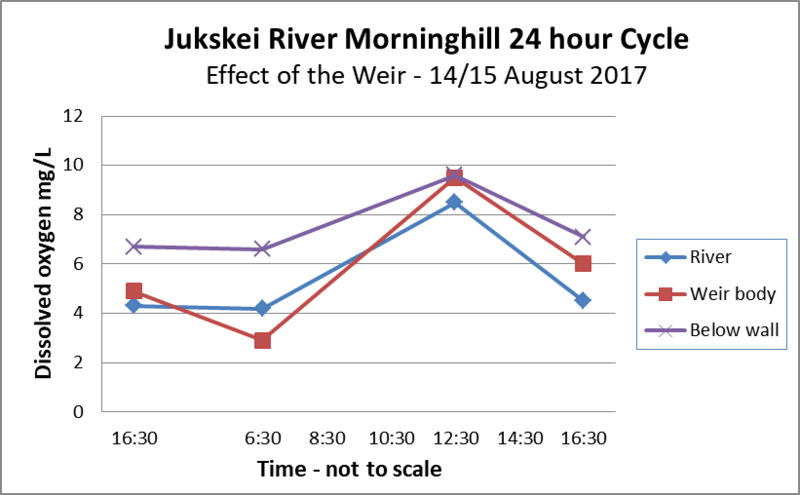 The smell at the river was present throughout the day and peaked at sunrise, but was not particularly strong. 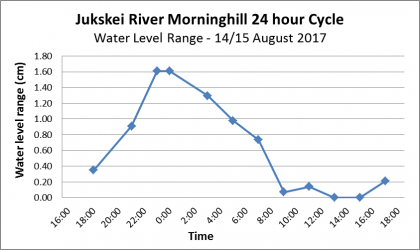 The water level started rising from 6 pm and peaked at about midnight, returning to the daytime low about 8 am. The range was small, about 1.6 cm. 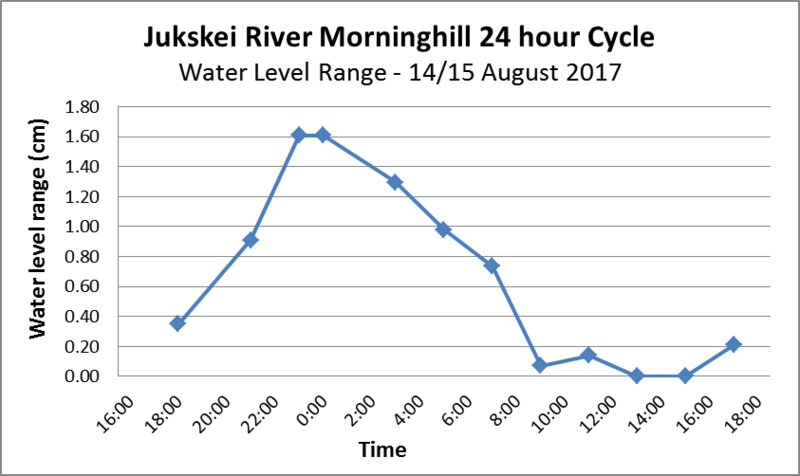 Other measures of pollution showed no change over the 24 hour period. The water was too clear for turbidity to be measured and remained so throughout. Total Dissolved Solids were unchanged. Foam below the wall of the weir was constant through the day but was more marked at sunrise. Foam is however more stable at lower temperatures, and no difference could be seen elsewhere along this stretch of the river. Conditions are not the same in the typical part of the river, (the site in the photo above), in the dam where the rate of flow is slow, and downstream after the turbulence of the waterfall. The water was monitored at two additional sites, immediately above and below the wall. The next graph shows DO at the three sites, four times over the 24 hour period. The range is greatest in the dam, with a minimum of 2.9 and a maximum of 9,6 mg/L, but this does not amount to anaerobic conditions. DO was always highest below the wall, particularly at the sunrise minimum, showing how effective the aeration is as it tumbles down. The DO was also higher at sunrise at the upstream site, where the river was fast flowing but not turbulent, compared to the weir. The Morninghill Smell does not come from anaerobic digestion of accumulated sludge, but from the continuous flow of sewage pollution from upstream. The dam behind the weir is shallow, the smell was not typical of anaerobic digestion, and the river along this stretch is reasonably aerated. The smell appeared to be trapped near the river by temperature inversion. These conditions dispersed with the breeze that started at sunrise. The pollution and smell problems in Morninghill are linked directly to the source of sewage pollution upstream in the Johannesburg CBD. These problems will only be resolved when the source is addressed. 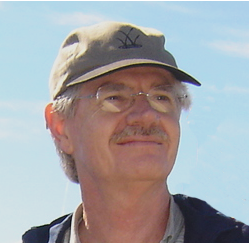 For more background on the Jukskei River and its pollution problems go to Jukskei River. The site of this project was about 100 m upstream from the wall of the weir at Clarkson Rd, and at the wall of the weir. Water level: A time lapse camera recorded water levels at night and manual photographs were taken during daylight. Smell was assessed subjectively by two people. The levels of smell shown are relative to each other over the monitoring period. Total dissolved solids: a TDS tester which also measured temperature. Dissolved oxygen was measured with dissolved oxygen meter which also measured water temperature. My sincere thanks to local resident Gwen Doran for participating in this project and recording results during part of the monitoring period. Without her presence the project would not have been possible. 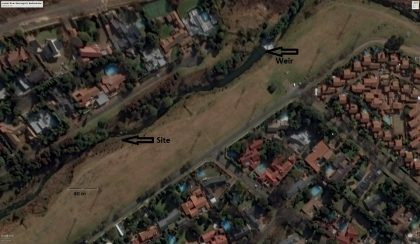 Question: what is the little river (relatively pristine) that flows through the Observatory Golf Course & confluences with the grey water of the jukskei from CoJ/Ellis Park just north of Mandeville Sports Centre east of 10th Street between Bez Valley & De Wetshop Ext 1? I ask, urgently, because there is a JRA knee-jerk “jobs for friends” project proposed that will tamper with that stream/river as opposed to diverting the funds to the more urgent matter os massive sewerage pollution in the Jukskei! I look forward to hearing from you a.s.a.p. Thank you Irwin and Gwen! Has this been sent to Joburg?